Contact Mercedes-Benz of Scottsdale today for information on dozens of vehicles like this 2019 Mercedes-Benz CLS 450. This Mercedes-Benz includes: BLACK, NAPPA LEATHER UPHOLSTERY Vinyl Seats Cloth Seats Leather Seats Premium Synthetic Seats HEATED & ACTIVE VENTILATED FRONT SEATS Cooled Front Seat(s) Heated Front Seat(s) PREMIUM PACKAGE Keyless Start HD Radio Heated Front Seat(s) Satellite Radio Power Door Locks Keyless Entry IRIDIUM SILVER METALLIC EXTERIOR LIGHTING PACKAGE AMG LINE Floor Mats BLIND SPOT ASSIST Blind Spot Monitor PARKING ASSIST PACKAGE Automatic Parking Back-Up Camera BURMESTER SURROUND SOUND SYSTEM Premium Sound System *Note - For third party subscriptions or services, please contact the dealer for more information. * You appreciate the finer things in life, the vehicle you drive should not be the exception. Style, performance, sophistication is in a class of its own with this stunning Mercedes-Benz CLS. Added comfort with contemporary style is the leather interior to heighten the quality and craftsmanship for the Mercedes-Benz CLS Where do you need to go today? Just punch it into the Mercedes-Benz CLS on-board navigation system and hit the road. 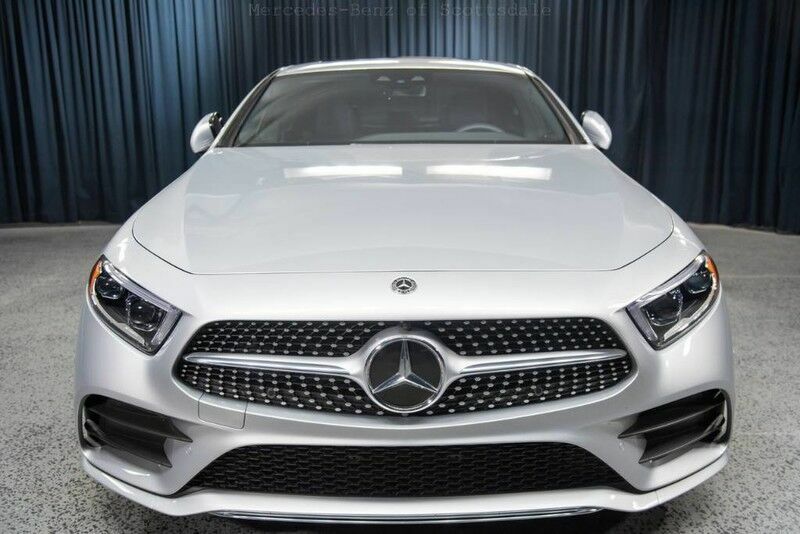 This outstanding example of a 2019 Mercedes-Benz CLS CLS 450 is offered by Mercedes-Benz of Scottsdale. There's a level of quality and refinement in this Mercedes-Benz CLS that you won't find in your average vehicle. You've found the one you've been looking for. Your dream car. This is the one. Just what you've been looking for. There is no reason why you shouldn't buy this Mercedes-Benz CLS CLS 450. It is incomparable for the price and quality.